As long as I can remember, I’ve been a morning person. Sure, I rely heavily on naps, but when it comes to being up with the sun, I’m all about it. 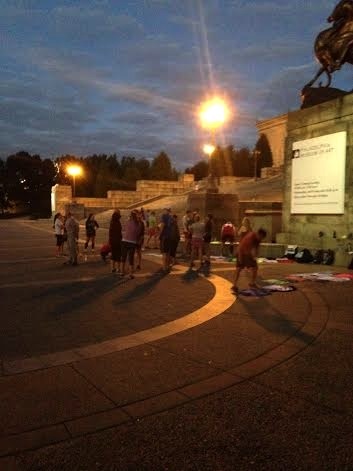 That said, when my buddies began raving about this workout “thing” they did on the steps of Philly’s Art Museum, I was initially intrigued and then immediately lost all interest upon finding out the start time was 6:25 in the morning on a Wednesday. See, it doesn’t really feel like “morning” when the sun’s not up. Don’t tell that to the Project November folks! But if old dogs can learn new tricks, I certainly could wake up at (UGH) 5:30 to see what the fuss was about. 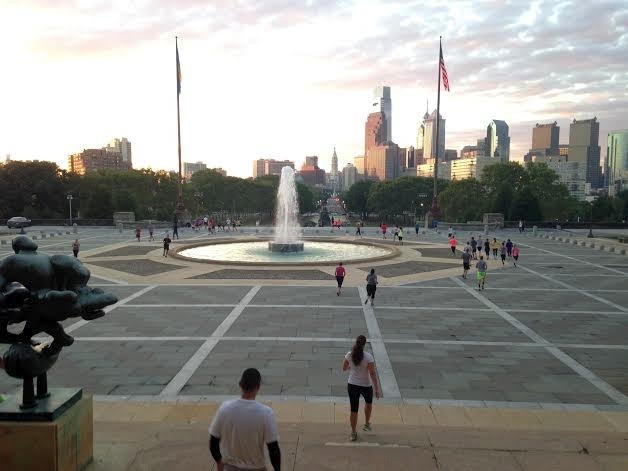 I hopped on my bike, scooted up to the Art Museum, and was shocked to find not only a healthy mass of people BUT a feeling of excitement in my heart for this crack-of-dawn sweat sesh. Sun’s not out. Guns still are. November Project™ is a FREE fitness movement that was born in Boston as a way to stay in shape during cold New England months… Our members vary from Olympic medalists, professional athletes, marathoners, triathletes, current and former collegiate athletes all the way to complete fitness rookies and recent couch potatoes just looking to kickstart their healthy life choices. If you think that you’re not fit enough to join the group, stop thinking and come see what the fuss is all about. So I did. Luckily, I wasn’t alone in this insanity, and managed to rope a few buddies in for the fun. 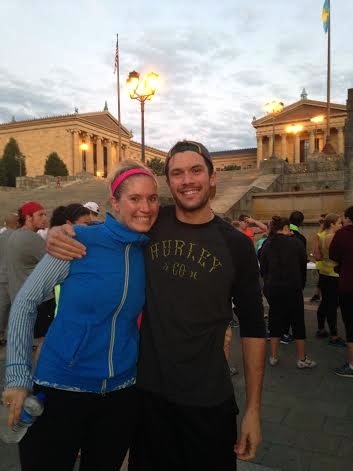 Brother and I, moments before we hit the steps running. Part of the reason I was so excited to check out this November Project is because my friends that do it…. they’re like FANATICS. Seriously, I feel like the term “cult-like” has negative connotations but… you get it. They wear branded shirts, they call the entire group “The Tribe”, and there’s this genuine pride and love for the movement. That’s the kind of thing I love, so I couldn’t stay away forever. we threw a few decks at the bottom of the stairs, ran the stairs and flipped cards at the bottom. 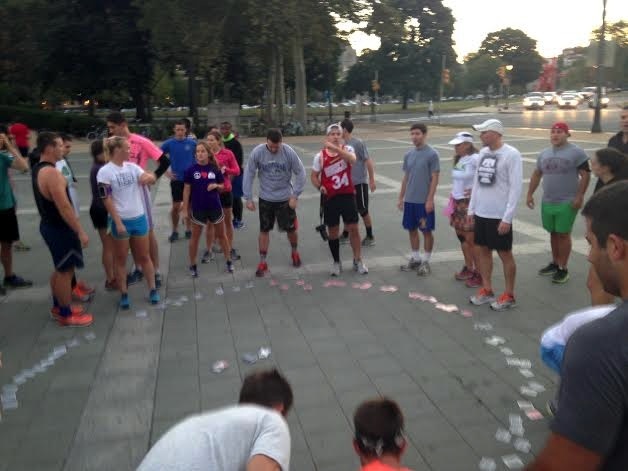 Face cards required finding a buddy, running up the steps and squat jumping to the Art Museum door, Aces required finding a buddy and sprinting the loop, all other cards were a standard push-up/squat deck workout followed by running the steps. And the view wasn’t too bad, either. Oh, hey, there’s my pal Susan! It wasn’t easy. 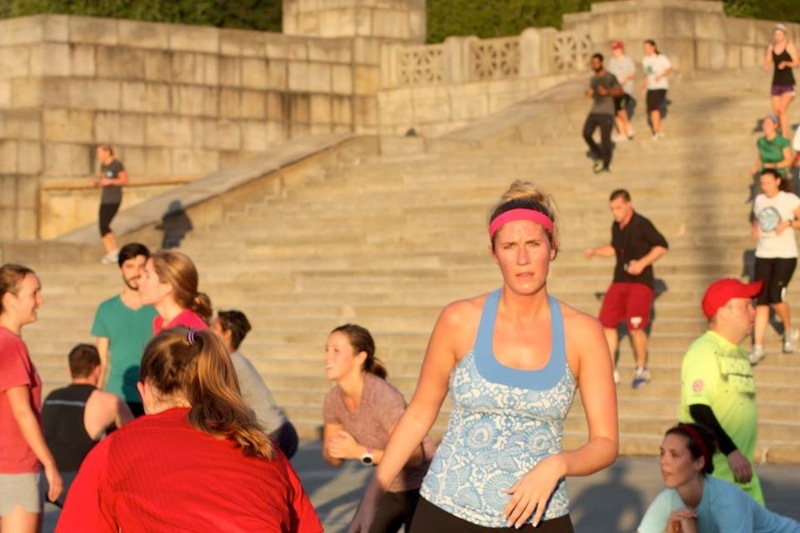 For this non-runner, running up and down steps, laps around the steps, and generally all running is…. less than ideal. 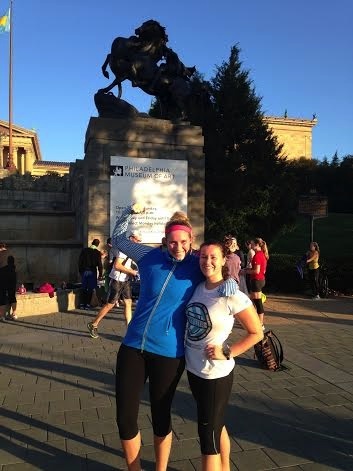 But the energy was contagious and these fitness fanatics kept a smile on my face…. most of the time. 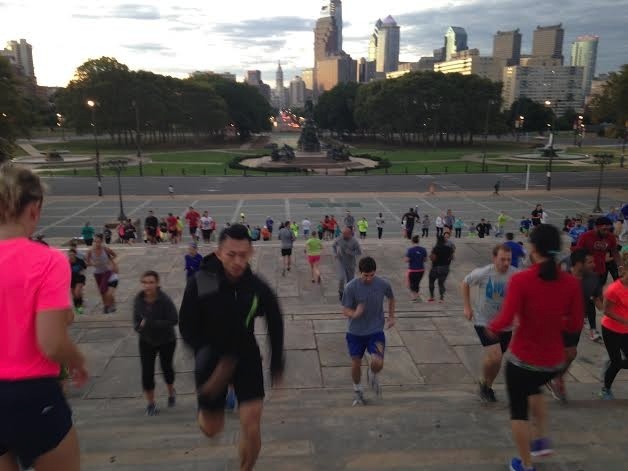 Photo Credit to the November Project blog! But then…. I felt great. I went into work sweaty and smiling, and though I didn’t rush back on Friday to join them again…. I kinda think I’ll be making a habit of setting that alarm for Wednesday mornings…. FIRST TIMERS!! WE DID IT!! Ugh its hard for me to go to yoga mid-day! Way to go!